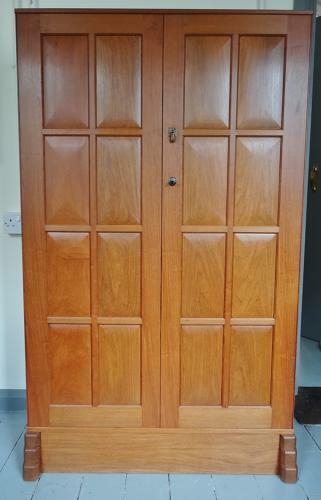 Superb two door floor standing cabinet (possibly cherrywood) by one of the top Cotswold School craftsmen, Hugh Birkett (1919-2002). Signed and dated to back for both 1965 & 1989. This cabinet was commissioned by his Oxfordshire clients for their son`s 21st birthday in 1965 originally to function as a gun cabinet, with a typical rack in the back right hand side to hold the guns; and the original shelves on the left to hold the boxes of cartridges etc. At the time the rules governing the storage of shotguns was far more relaxed than it is now. However, when the Home Office guidelines changed, the cabinet was given back to Birkett to alter internally (hence the second date of 1989) so that it could accommodate a steel safe instead of the guns sitting on an open rack. The steel safe has since been removed and replaced by further useful shelving. Would work very well as a linen or hall cupboard or indeed bookcase. Hugh Birkett was a furniture maker and master craftsman who was influenced by the work of both Ernest Gimson, Romney Green and Edward Barnsley. He set up his own workshop in 1949 in Solihull and then later moved to Moreton-in-Marsh in 1966, where he continued to make furniture in the the tradition of the Cotswolds Arts & Crafts. He was also a master bookbinder. Approx 60" high, 15" max depth at base, 37" widest.